On Monday, I shared with you an interview with Josh (AKA JB), co-owner of The Hackers Paradise. Josh talked about why so few women join golf forums and what makes THP different from the big incumbents out there. Today, I’m pleased to introduce to you to the “better half” of that team (LOL – no offence Josh), the female co-owner of THP, Morgan (AKA Golfer Gal). Morgan is a fairly new golfer, but a passionate one and I’m excited to talk to her. She’s the kind of person who can make a difference in this male-dominated online world. 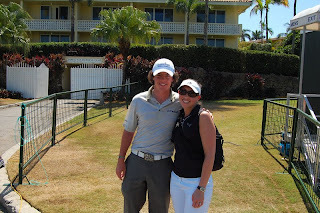 Just check her out with Rory – oh my! Is that not cute or what!!! Golfer Gal is a little shy about being on camera herself. Here, Morgan tee’s it up. Good form, GF, but next time, look up…look waaaaaay up, and I’ll call Rusty! (Did I just age myself there?) ;). And then here’s Morgan with Stacy Lewis, the LPGA player who won our hearts at last year’s US Open. Remember, Johnny Miller labeled Stacy as the next LPGA superstar. Morgan, you certainly know how to mix it up with superstars! You go girl! So if you are wondering about entering the dark world of golf forums, understand this …. Not all golf forums are created equal. Say no more…say no more.. But even if you don’t add your voice to THP just yet, at least enter THP’s raffle where you can win great prizes and donate to terrific charities at the same time. I have never tried golfing in a sea-side golf course. It must be a great experience, admiring the view and savoring the sea breeze.